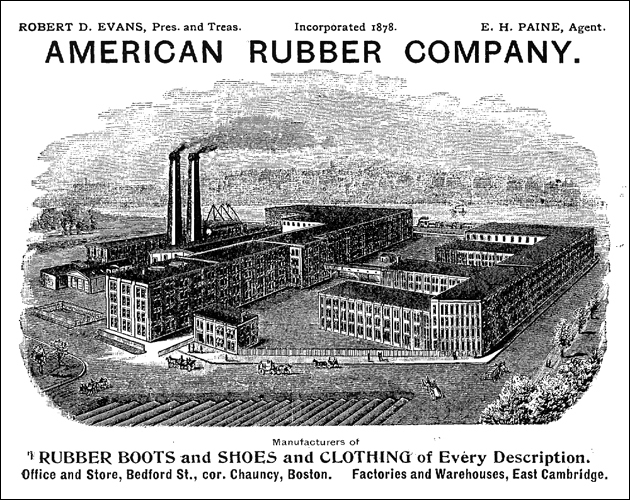 The American Rubber Company was established by R. D. Evans in 1872. The Boston business – which produced rubber shoes, boots, coats, and wringer rolls – moved to Cambridge in 1877. The original Cambridge plant was destroyed by a fire in 1881 and a new, larger plant was immediately erected on the same property. In 1892, the company was acquired as a subsidiary of the United States Rubber Company. By 1896, the American Rubber Company had approximately 1,500 employees and a factory that covered over seven acres (Stone, 1930).